The wind may be a blowing and the snow may be fluffy under foot, the blustering weather may have you hiding under your duvet reaching for the snooze button, but over in La La Land the stars were out in full flourish for an evening of grace and glamour for the 74th Golden Globes Awards. An evening dedicated to celebrating the bold and the beautiful, where film and television actors collect and collide, where it's an honour to be nominated let alone taking home the prized awards, and this years event was no exception! As well as being super thrilled to read that some of my favourite thespians were nominated (and winners!! ), for me it's all about the glitz and glam of dress up! Being a costume gal, the awards season is more about seeing the stars mix personality with fashion adding a healthy dose of drama, ready to strike a pose as they hit the red carpet. There were so many gorgeous looks that this ended up quite a photo heavy post, though amongst the sparkles and tuxedos, periwinkle chiffons and splashes of yellow, I'm sure you won't mind! 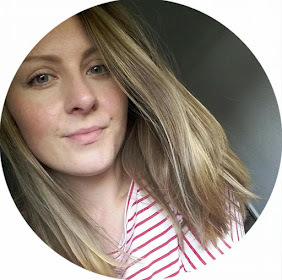 Let's kick off this post with a round up of my most favourite looks of the evening! The plunging yet classy necklines, the gorgeously delicate fabrics, the dusty periwinkle and scattering of stars, these 5 looks are just simply stunning. Mandy Moore looks like a goddess in this almost sheer Naeem Khan gown, Evan Rachel Wood cuts a fine silhouette ditching tradition and reaching for a classic Altuzarra tux and wearing the heck out of it, Kristen Bell stuns in this sequined Jenny Packham gown. Jaw droppingly beautiful in Vionnet Anna Kendrick brings a softness and delicacy to the red carpet and Emma Stone dazzles in Valentino Haute Couture and happened to win Best Actress in a motion picture for comedy or musical! The cool kids mixing it up brought cut-out shapes, texture, colour and florals galore! Jessica Biel looked red carpet ready in this seriously stylish Elie Saab dress, Olivia Culpo stole the night in this dramatic number by Zuhair Murad bringing a gallery worthy gown to life and posing like nobody's business and Busy Phillips looked cute as a button in this super flatering cut and by adding a touch of nature, to her otherwise classic black dress, raised her fashion game to master. A refreshing blast of sunshine in a sea of monochrome, these bright lovelies stood out from the crowd. Viola Davis sparkled and shined in an asymmetric Michael Kors dress, a glowing Natalie Portman looked divine wearing this retro glam Prada outfit and Reese Witherspoon did what she does best and smoldered in this spring-fresh strapless gown by Versace. There's just something irresistible about a classic red carpet look and these outfits scream luxury. 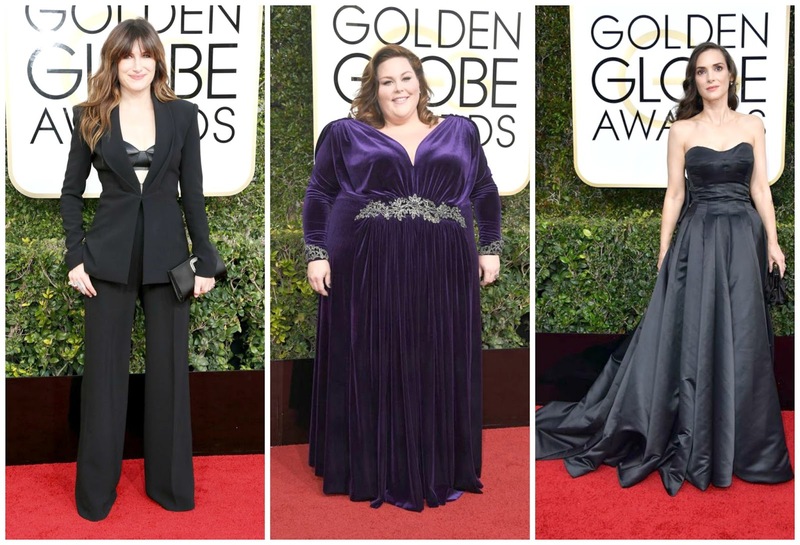 Adding a badass twist to a classic, sharp cut suit Kathryn Hahn slayed in Brandon Maxwell, Chrissy Metz went for pure Hollywood with a velvet amethyst Nathan Paul dress and Winona Ryder in custom Viktor & Rolf showed how mixing old school glamour and gothic beauty makes one heck of an awards look. The beautiful Gillian Anderson gives me goosebumps in this ethereal Jenny Packham show stopper and killing it in a classic Vivienne Westwood is Gwendoline Christie. Sugary sweet, these beauties opted for feminine floatiness and set jaws a droppin in these four other-worldly looks. Lily Collins is all frothy princess in Zuhair Murad, the gorgeous Connie Brutton wore a sophisticated blush pink Georges Hobeika dress, Kristin Cavallari was sultry and sparkles in Idan Cohen and Drew Barrymore floated to greatness in this fairytale worthy dress by Monique Lhuillier. 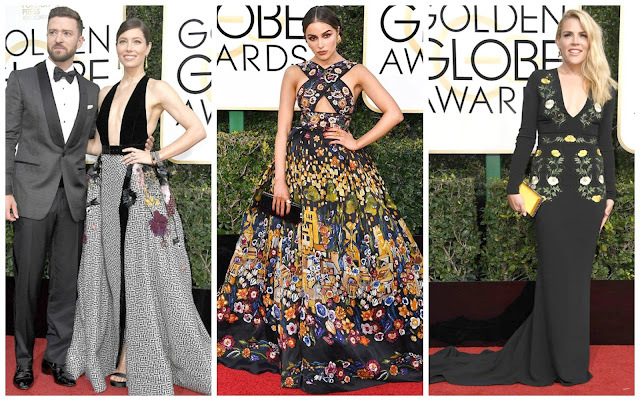 Phasers were set to stun at the 74th Golden Globes as many an attendee adorned their bodies in precious gems, and these four looks dripped with diamonds! Ruth Negga looked out-of-this-world in Armani Prive, Priyanka Chopra was a shimmering vision in Ralph Lauren, the stunning Felicity Huffman rocked this Edition by Georges Chakra number and shining bright like a diamond was Regina King in this Romona Keveza floor sweeper. Let's here it for the gents, looking mighty fine in their Sunday best. The oh so intensely charming Milo Ventimiglia stunned in navy Ralph Lauren, Award Winner Casey Affleck chose a 3 piece by Dolce & Gabbana, gorgeous Christian Slater wore a slate grey Armani suit and stealing the show with his sweet heart of a speech, and of course actually winning by picking up an award, Ryan Gosling in a Gucci tuxedo. 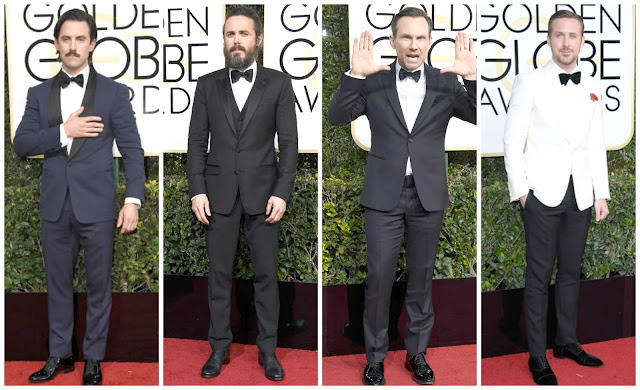 This gang of suave vagabonds had the time of their lives by mingling with the rich and famous and posing the heck out of that red carpet, whilst looking pretty darn smart. 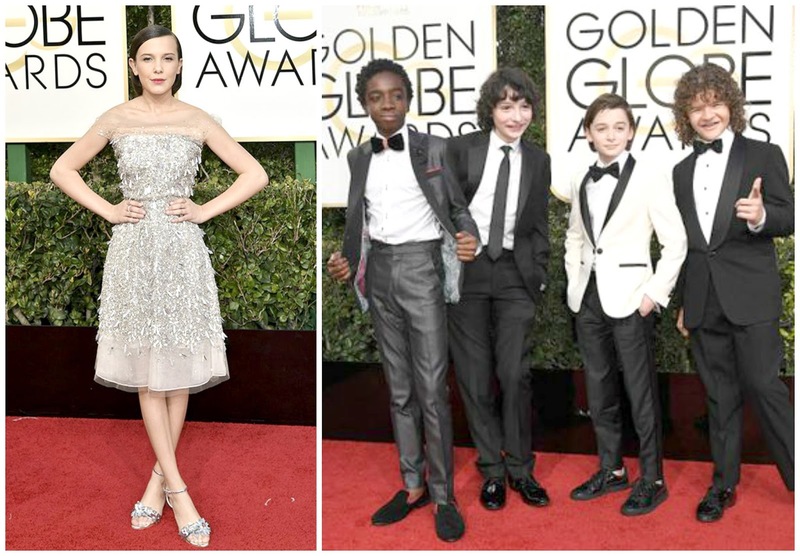 Milly Bobby Brown looked every bit the star in Jenny Packham and the boys didn't let her steal all of the lime light as they rocked their tuxedos like true heroes. There you have it my friends, a fabulous dose of showbiz sparkle to brighten your day. I don't know about you but awards season always makes me want to binge on motion pictures and marathon a series or two! What better excuse to head back under that duvet, grab yourself a hot chocolate while you're at it and tune in for some glamour and escapism- well, until Spring arrives at least!